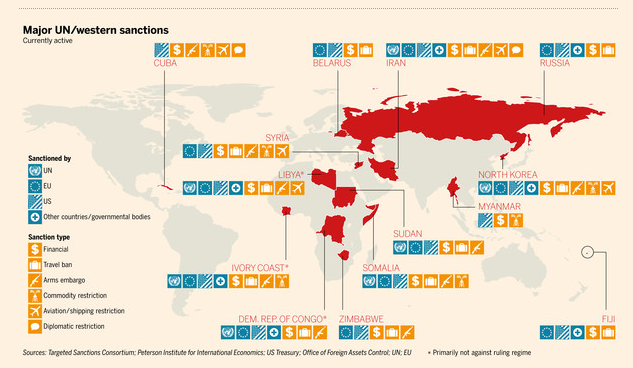 Nice FT piece on sanctions. They are everywhere. If a country behaves badly in the world, hit them with sanctions. Take aways their goodies with some old fashioned punishment. We can feel good about doing something and maybe the culprit will change. Accept in reality that is not the way the world seems to work. We isolate and hope the behavior will change. Unfortunately, it seems like the impact is not great. Are sanctions too weak? Hard to say. While sanctions try to be targeted, in reality most of the local population is harmed. It would be nice if we had a better way. The Ukraine-Russia crisis creates unique risks in the commodity markets that are hard to price, but not impossible. The impact of this seemingly far-off stand-off can be significant for a number of markets. First, there is the new landscape for energy markets. The risk of being dependent on Russia for a source of energy is too great. There will be a shifting of suppliers for the EU over the next few years. The flow of oil and nautral gas will change and will cause price dislocations. The competition for Middle East oil and gas will increase. Second, there is the potential for disruptions in grain markets. The Ukraine is not one of the largest grain exporters, but on margin a dislocation in their business will be felt in the US, Argentina, Canada, and Australia. The power of logistics will again cause price distortions if we have a tight supply year. Third, there is a risk in precious metals markets. With Russia being a major supplier of palladium, there will be a price impact from any bank sanctions. Note that all of these dislocations will lead to higher prices while equity and bond markets will be negatively effected. There is a benefit from being long commodities when there is higher geopolitical risk. So now the Fed chairman is a dove. Earlier in the month she was a hawk. The word of choice is now to say the economy is filled with "slack". Is this the forward guidance the market needs? These types of comments just creates uncertainty and will increase the risk premia in both stock and bond markets. The central bank cannot solve the employments problems of the individual. It should solve the problem of risk and uncertainty through having a well-articulated clear policy. By solving the group problem, the individual will be helped. 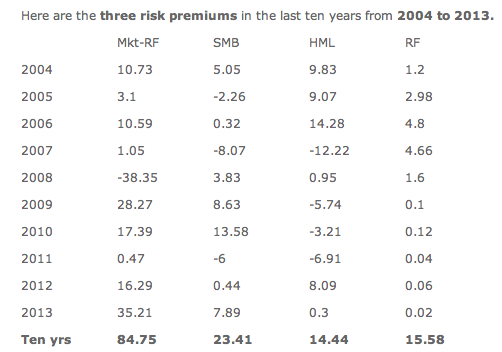 The simple chart presents the Fama-French risk premiums over the last ten years. The first column is the market risk premium over the risk free rate. The second column is the advantage of small cap over large cap stocks. The third column is the value over growth premium and the last column is the risk free rate of return. Holding equities was a winning strategy in every year except 2008. The small cap and value premiums are smaller and more volatile but will provide value over the long-run. It is surprising that the small cap and were not larger for 2013. Large market premiums do not mean large premiums for other factors. Just holding the market basket was the real winner. You did not have to be cute or overly thoughtful last year, but by any measure last year was an exception not the norm for equity investing. Do not beleive that last year was a normal trend. Thinking through the asset allocation decision has to start with some benchmark; however, there is no conventional approach to determining a baseline. This becomes especially difficult once you move beyond the simple 60/40 stock bond approach. You can easily argue for more diversification through holding more sectors, but the actually number and weights become difficult to explain. If you look at the total market capitalization between stock and bonds across the globe, you will find that bonds make up about 70+% versus just over 25% for equities. The bias should be to hold more than 50% bonds in a base portfolio. In the US, the bias to bonds relative to stocks would be approximately 60/40 in favor of bonds. The US represents just over 26% of total bond capitalization and 44% of total equity capitalization. Any investor should hold more international assets. There has been an argument that a good allocation approach is to weight equity markets by the size of their GDP; however, there is a significant difference between market capitalisation and GDP as seen in the graph below. The market capitalization is biased toward momentum in stock markets. Those stock markets that are performing better will get larger allocations over time. The closet momentum allocation procedure should cause some concern for investors although it is consistent with the idea of holding momentum stocks. If there is no easy answer, no problem just do what is comfortable and offers good diversification. Just accept that your baseline may not match the consensus and this will need some explaining when under performs occurs. The above tables were taken from an article in the Journal of Indexes. It focuses on one of the key problems of commodity investing, determining what is the right commodity index to use for an allocation decision. Selecting a commodity index is a problem because the cost of being wrong is significant. There is a wide dispersion in the risk and return with commodity indices that is not seen with fixed income or equities. There is actually a simple reason for the large dispersion. 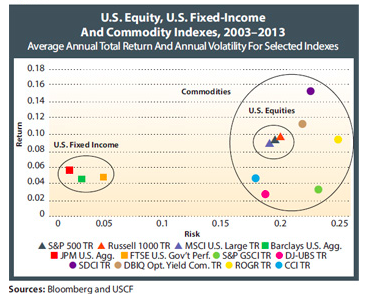 Commodities do not cluster as closely as fixed income or equities. The correlations between sectors are low. Energy is not the same as agriculture or metals. Hence, you cannot view commodity indices as being similar when small changes in weights will have a big impact on returns. 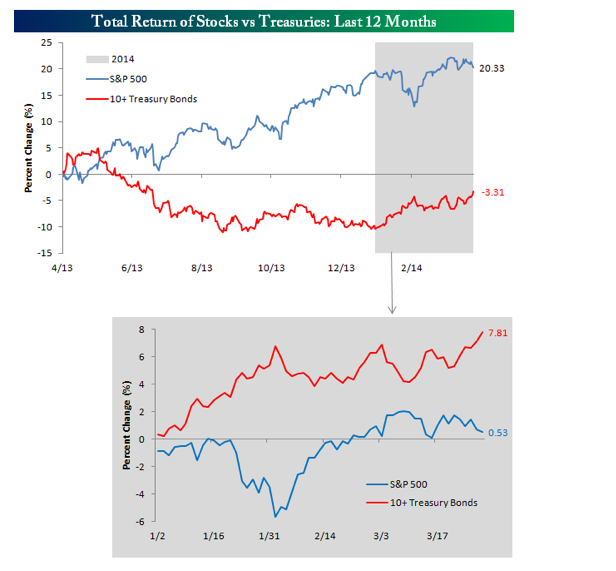 Bespoke Invest presented a nice simple chart of the difference in stock and bond returns. Now if we can have nice simple anaswer for the why of strong bond performance. Last year it was all about stocks with the bond sell-off focusing on the taper issue. Now we have the taper program and bonds have actually improved. Sell the rumor, buy the fact? The flat stock market after a strong run may be expected. The taper program reduces excess liquidity which should slow equity gains; however, the strong bonds gains is a little bit of a mystery. Weaker growth is one answer. Low inflationary expectations is another although there has not been much change in the inflation protection swaps. Bonds rallies at low rates is something that perplexed JGB investors and looks to be a potential problme in Treasuries. I am unconfortable with the Treasury as hedge negative correlation argument. Weaker equities mean strogn bonds is a statistical relationship not a cause and effect. How did we get 60/40 as the benchmark? Spending time on asset allocation decisions, it seems that the standard for comparison is a portfolio of 60% equities and 40% bonds. Can you beat this benchmark? Is risk parity better than the 60/40 mix? Is the endowment model better than 60/40? How do you take tactical allocations tilts around the 60/40 benchmark? Everything seems to be compared to the gold standard, 60/40. So why is this standard so good? It has done very well in the long-run because of the natural hedge between the two because of the negative correlation over long periods. There are periods when on an absolute basis it will not look very good, but the controlled volatility has made it a winner. We cling to this standard for some reason, yet on a conditional basis, it may not make sense. In a low rate environment, bonds will be a performance drag. when inflation is rising, bonds will also be a drag even if it provides diversification. Other benchmarks also have problems, yet there needs to be some well-defined goalposts for asset allocation. We seem to have a desire to change the goalposts from 60/40, yet we always return to this standard because there has been little agreement on a new standard. There needs to be a framework for determining the new standard and the idea of more asset classes as better may not be the right solution. A friend asked to hep with a speech to a group of investors concerning some of the key themes for the year. I focused on somber tone after a great performance year in equities. Expectations have to be tempered. Here is an outline of my thoughts. Focus on the big picture - which is most important - how do you protect your money? there are many different approaches; this is why we offer many products. the average length of time in the post-WWII period from trough to peak is 58.4 months. The trough was in June 2009.
only 3 of 16 rallies since the Great Depression have lasted more than 5 years. Risk are growing as the market continues down this path of successful wealth creation; see it in bond covenants, the reach for yield, return chasing. Overconfidence and Optimism - In ourselves or expert advisors. Data Mining -Finding patterns out of randomness to predict the future. Anchoring -Mentally locking in a price even though it is now irrelevant. Hindsight Bias -Predicting the past as if one knew what would happen. Fear and Greed -Running from a down market and toward a bull market. Mental Accounting -Believing we are doing better than we are. Status Quo - Aversion to change. This from an interesting wealth consultant, but it does not address directly how to deal with these problems. All of the above can be addressed through a systematic approach to investing. Overconfidence and Optimism -The model is the expert and it has no ego. Data Mining -A model can be set to have tolerances to avoid data mining. Only choose those factors that are statistically relevent. Anchoring -A computer geenrated model does not care about a preset price accept if it is programmed to view it as important. Hindsight Bias -Models can be built that adds uncertainty. The mapping betwween model and decision can be adjusted so that stronger (weaker) signals lead to larger (smaller) risk exposures. Fear and Greed -Structure can be added to hold winners and sell losers. Mean reversion can be added to offset issues of extreme moves. Mental Accounting -A model can focuson the critical issue of dollars in and dollars out. Status Quo - A model can always be adjusted or adapted to the environment. The first graph is from work on decision-making. The second graph is from a US Forest Service decision-making tool presentation. Both look at how decisions can be characterized. I am a strong believer in systematic trading. It eliminates or certainly reduces behavioral biases and it provides a consistent framework for repeatable success. It takes the stress out of money management and allows for focus on consistent relationships in prices and fundamentals. However, there also has to be an awareness that all decisions cannot follow a disciplined script. The framework can be structured, but we have to accept that non-repeatable events may need another framework. We work under different time constraints and information rules and we have to accept that this means different decisison tools or approaches have to be employed. 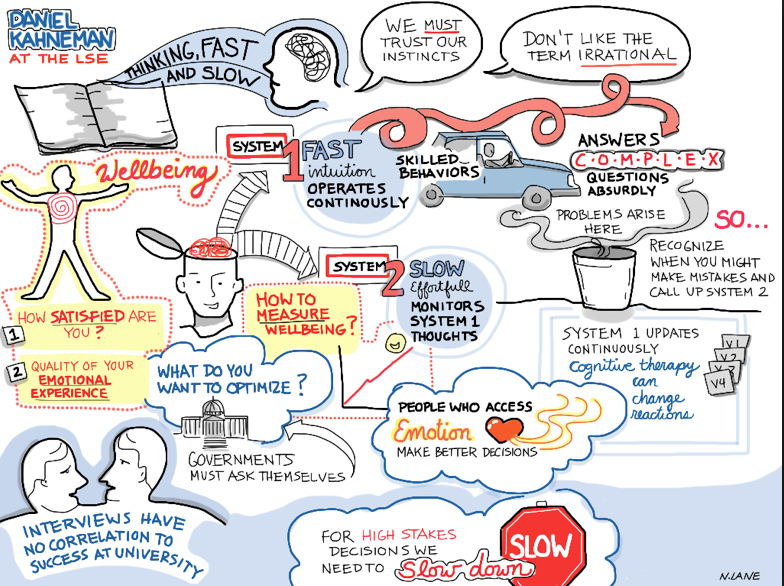 The first graphic looks at the issue of decision-making under time stress. All investors are faced with this type of stress in moving markets. When time stress is high, we will revert to simple pattern matching. As time stress decreases we can focus on a more detailed approach. A systematic approach is a way of dealing with time stress and information overload problem. It leaves time for those problems that need more time and thought. The second graphic table shows another way that problems can be addressed based on its level of stress and information requirements. A simple level 1 problem is just a matching problem. Every time we see same types of events we just react. We have a lot of experience with these types of problems. 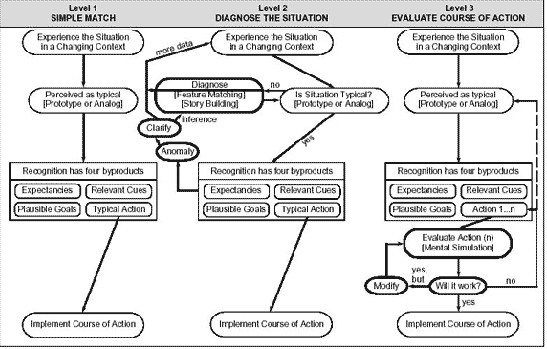 The second level is where there needs to be some diagnostic work to assess the type of problem and a form of categorization. The third level requires evaluation and modification which is the most difficult. If markets are fast paced, it is hard to have the time to conduct all of the analysis. There needs to be a way to sort problems into different levels and a way to act accordingly. We cannot evaluate all problems in the same way. A simple catogorization can help with that prcoess. If you do not review your investment mistakes or losses, can you behave as if they do not exist? It is painful, but doing performance attribution is very helpful. This review is the type of attribution where we ask, especially when something goes wrong, "How did we make that decision?" Nevada Lane of the Five Elements Consulting Group showed in a single graph the work of Daniel Kahneman when he gave a talk at the LSE. I like the single picture and the use of visual aids to develop ideas. Nevada shows how graphical recording or visual work can be employed to help with learning and decision-making. I am not going to be a "graphical recorder" but this picture says a lot. Perhaps we should use more graphics to help us understand difficult concepts? 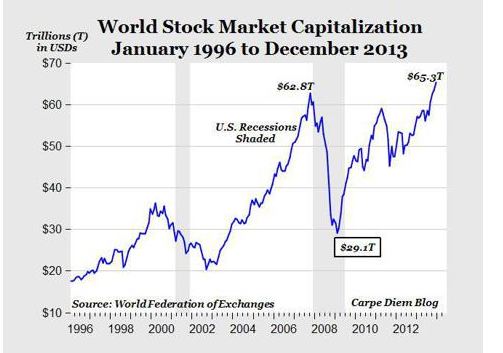 This simple graphic tells you all that you really need to know about the breakdown of major stock indices in the US. If you have the S&P 500, you cover 75% of the total market capitalization but you are missing the small cap allocation. 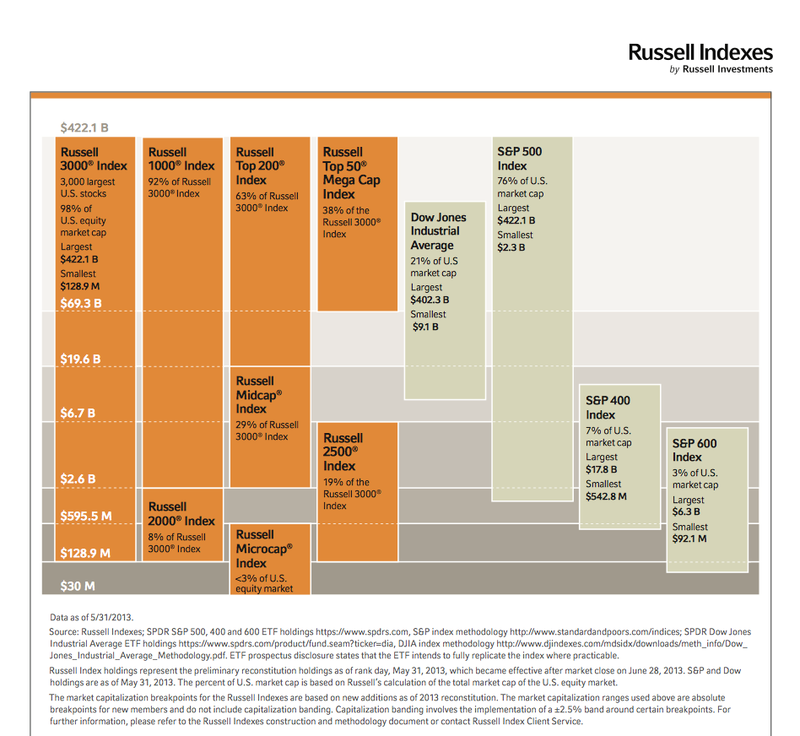 Adding the Russell 2000 will cover the small cap universe and will not overlap with the market caps of stock in the S&P 500. If you add the S&P mid-cap index, you cover the gap between the S&P 500 and the Russell 2000. All three can be traded through ETF's. Hence, the simplest way to cover the US equity markets is through a weighted three asset portfolios of ETF's. Of course, there are broader market ETF's that can be employed to cover the market, but then an investors does not get to make any tilts between small and large cap portfolios. The difference between small and large cap performance is consistent with a number of factors. Small caps are more volatile and more sensitive to business cycle risks. Early in a recovery, small caps should outperform larger companies. Small caps are usually more highly levered and sensitive to rates. They will also be more sensitive to available credit. They will also be more sensitive to the innovation cycles. However, small caps will be dragged down by increasing costs of regulation. They do not have the same economies of scale as large firms. Small caps will have more domestic focus; consequently, if there is greater global growth the big names should do better. These returns differences are significant enough to allow for some asset allocation tilts that are consistent with changes in the growth cycle. Simply put, if you are pro growth you should be pro small caps and provide a higher risk weighting. What is driving EEM sell-off? The Bloomberg financial conditions indicator shows what everyone who has been playing in the emerging markets is feeling, conditions in EM are not very good. The divergence between the developed and emerging world has been going on for about a year. 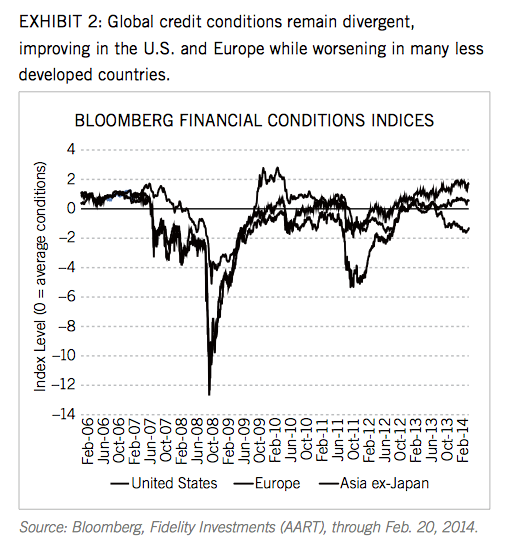 What is notable is that the financial conditions showed much more extreme movements in 2008 in the developed world. Emerging markets in Asia were relatively much more stable. Now we are seeing bigger swings in the EM financial conditions which are consistent with capital flight. The is little reason to believe that EM stocks will find strength if finical conditions are still divergent. 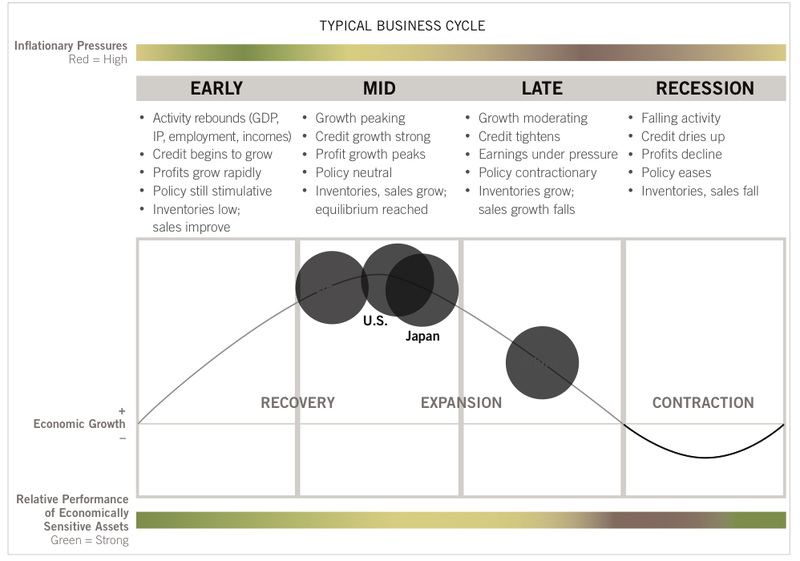 Business cycle - where are we? There always needs to be a focus on the simple questions for investors, "Where are we in the business cycle? "The Fidelity Asset Allocation Group provided a recent piece on their views on growth with a stylized picture of the business cycle. Their view is that we are at the mid point of the cycle. This seems to be the consensus view even though this recovery has been in place for almost five years. The Fed thinks that growth is strong enough to cut QE but not so strong as to raise rates for another year. This could argue that we are still in the recovery phase regardless of length of time. The pessimist would argue that we are late in the expansion process given the slowing in the last quarter. Whether optimist or pessimist, the real issue for investors is that US economic growth has been below trend which means that growth should not sustain the current stock market. Further increases in prices will have to come through gains in valuation. This could continue in 2014, but it requires a higher level of optimism than what is currently felt by investors. Many have thrown around terms associated with behavioral biases. In fact, I would argue that these terms are tossed around with such a cavalier view that few know what is actually be said or discussed. The behavioral bias discussions have hit a wall of imprecision in language. The table above provides a nice solution graph of different ways to look at the representative bias. This was created by IHMC Cmap tools, but there was no author that I can attribute to its origin. This graph does a good job of discussing the small sample problem, looking for similarity, the base rate fallacy, and other issues that are all associated with the broader issue of representativeness. This should provide clarity. This is a nice simple graph from a good website on decision-making. 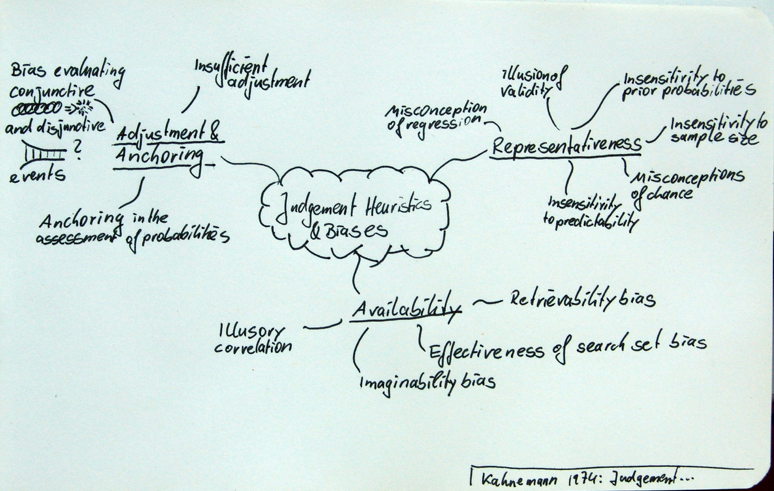 It provides a mental map of the early Dan Kahneman work on behavioral biases. We have come a long way over the last three decades, but there is still much to work on to eliminate our problems with decision-making. I thought this was an easy question and it is if you believe that the world consists of just two, equities and fixed income; however, the complexities mount and you try and break the world into finer categories. You will always find that most questions are easy until you have to provide your own useful working answer. To define an asset class, you have to ask, what is the essence of the class? The essence of any object is its attributes or its substance. The essence is what it has to be its necessity. What does the object do? If it loses those special attributes that are necessary to its existence, it loses its identity. In philosophy, we can go back to Aristotle and discuss definition or essence through the word, horismos as described in the Metaphysics. 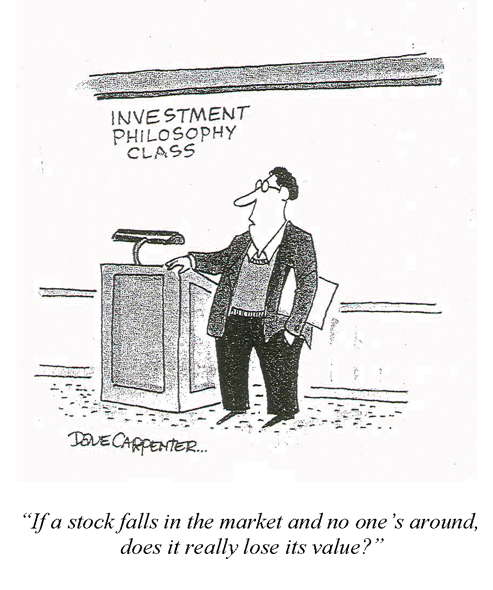 So why go back to philosophy to discuss the definition of asset classes? The answer is simple. Describing or using the right definition is not easy and you want to be more thoughtful than just providing the obvious. An equity is the residual value of the firm and the discounted futures earnings of the firm. Its essence is associated with risky cash flows. A bond is a claim on the firm and the discounted cash flows associated with a coupon. We all know the difference, but sometimes the essence of discounted cash flows become harder to describe when both have risks. For example, what about a credit? Credit products are not the same as a government bond, but it also is not like discounted earnings. There are risky cash flows, but a credit is somewhere in between. Hence, it has characteristics of both. The risks of some assets are not so simple to describe. The cash flows of any assets have different levels or sensitivities to risk. You can also think of an asset class through how it will behave to different risk factors. What is the sensitivity of equities to a change in inflation? The sensitivity will be different than what you will see with a bond. Is the essence of an asset class its sensitivity to a particular risk factor? You can classify an an asset by the type of risk premium that it is associated with. If the essence is related to its sensitivity to risk factors, does that mean an asset could move between classes based on how its sensitivity to risks change? You can have equities that behave very differently because their risk sensitivities are different. Some may not want to provide any definition but use a clustering methodology to describe or bundle assets into a class. This means there could be degrees of equity-ness based on where an asset fits within a cluster. Makes sense from an empirical point of view but what happens if the statistics change? A problem could exist with even geographical representations. Is a multi-national corporation with worldwide sales a US company? A UK headquartered firm may have little in common with local business or the country economy. Before you throw-up your hands, I will state that categories can be made and asset can be placed in these definitional boxes, but there are no hard and fast rules. We can define an asset by it cash flow types, but we also want to say that the essence of an asset is its sensitivity to risk factors. We ultimately bundle risk together in a portfolio so there is no getting away from risk sensitivities regardless of how you define an asset. So we make classifications and try our best, but accept that an asset class is not stable but a dynamic concept. There is an interesting fallacy associated with conditional probabilities which is also relevant for investors. It is called the Prosecutors Fallacy which is very simple problem but a trap that many of us fall into. The fallacy exists because the prosecutor argues that a small chance of innocence means there is a high likelihood of guilt. The change that someone is innocent given some damning evidence is not the same as the chance of finding the damning evidence for someone who is innocent. If we find DNA that has a 1/500,000 chance of being present with the accused person, that is not same as saying that the accused had a 1/500,000 chance of being innocent. We can apply this to the case of downturns in commodity markets and recessions. If we look at the number of recessions since 1970 based on annual data, there have been five. All recession years have shown negative commodity returns. The probability of a negative returns for commodities conditional on a recession is 1. However, the probability of a recession given negative commodity returns is much less only 50%. These are not the same. Conditioning in one direction is not the same as conditioning in the other direction. This is a classic variation on the line of causality and the sample of data available. Everyone knows that correlation does not mean causality but it still takes some time to digest what that means in any given situation. A high chance of two factors being linked is not the same as saying that one is the result of the other. Say exactly what you mean no more for no less. Good advice for any writer or anyone giving a speech. Harder in practice. No wants to be committed to precise wording. It limits future options. Central bankers do not want to be limited by their language, yet the new era of forward guidance is calling for more precision. 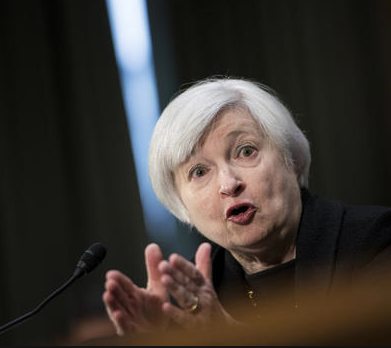 When Chairman Yellen says, "we use a wide range of indicator" to explain her commitment to raising rates or says, we will need to "assess progress" before making any changes, she is being very imprecise. Answering the question of when the first rate rise would occur, she answered, "something on the order of around six months". This is much more precise than some might have expected. Chairman Yellen is going to have to work on these communication skills. The issue is that imprecision causes more uncertainty and more focus on any announcement and this is not what we should expect from central bankers. 1. There is the tendency for high interest rate currencies to appreciate - the forward premium anomaly or carry trade. This does not follow the logic of uncovered interest rate parity (UIP). 2. There is poor correlation between consumption growth differentials and exchange rate movements; growth different should be related to the currency changes. This should not occur given standard assumptions of preferences and complete markets. Now the UIP relationship seems to hold well during the pre-10970's period, but has fallen over the last few decades which does not seem to make sense if we have free capital flows. The carry is the basis for much of international FX trading. The same change in empirical regulatory seems to apply for correlations of consumption which were well above .5 pre-1970's and now are closer to zero. During this time currency volatility increased substantially and there has been an increase in openness across countries as measured by the current count to GDP ratio. More openness, yet less correlation and a breakdown of basic relationships. Ricardo Colacito and Mariano Croce in the December 2013 Journal of Finance provides a solution to this international asset anomaly through looking at risk-sharing mechanism and wealth transfer risk-return trade-off model. When there are, for example, long-term growth differences and capital mobility, preferences may cause capital flows which will change the sensitivity between currencies and interest differentials. There is a lot going on with their general equilibrium model, but there are some simple take-aways for international investors. Do not accept recent empirical relationships as a given fact in all environments. When the structure of markets change, market frictions change, there will be an adjustment in empirical relationships. Place value on the data, but remember you need theory to explain the data. Making generalization with limited data can be a loser's game. There is some good work going on in macroeconomics since the financial crisis. The forefront of this research is to try and incorporate finance variables into macro models. In a recent model in a paper called "Risk Shocks" by Christiano, Motto and Rostagno, the authors take the standard monetary dynamic general equilibrium model and add a financial accelerator mechanism. The goal is to see how financial shocks such as what were seen in 2008 will spill-over to the macro economy. The intuition is somewhat obvious but the link between financial and credit effects and GDP has often not been fully modeled directly. Capital is invested based on a expected return but this return is uncertain. You don't know the pay-off when an investment is made and this uncertainty makes investing risky. Entrepreneurs borrow money through a debt contract but these debt contracts change in price because the expected pay-off changes. When risk is high there is premium for credit and it is harder to obtain. When risk is low, credit is cheap and easy to obtain. The risk associated with credit can be shocked by a number of factors and this causes counter-cyclical credit spreads and pro-cyclical investment. The shocks to risk include value of the stock market, credit to non-financial firms, credit spreads, and the slope of the term structure. Running simulations using this type of model, the authors find that fluctuations in financial risk can account for about 60% of the growth rate in aggregate US output. The implication are very important. Policy-makers should worry about what is happening in financial markets. Credit spreads and lending availability are important just like the overall rate of interest. Clearly, the focus by central banks on systemic risk is starting to address this issue, but the mandate of the Fed is for controlled inflation and full employment and is not looking to solve problems in the financial markets. For a global macro investor, the research sends a clear signal that watching risk variables in the financial sector will have benefit for determining the direction of economic growth. There is a growing view that commodities should not be considered separate or unique from other asset classes, but should be viewed within the larger context of risk premia in all markets. Hence, just like there is a carry premia in stocks or bonds, there is a carry premia in commodity futures. Just like there is momentum in other asset class, there is a momentum component in commodities. All markets are linked by a few risk premia like valuation, carry, and movement to name the major ones. This does not mean that it easy to compare risk premia across market sectors but the framework for review of asset classes should be similar. So what are the drivers of return or risk premia in commodity markets?An analysis of risk factors, including the futures basis, return momentum, volatility inflation, hedging pressure and liquidity shows some very interesting results. The main driver is the basis. This is similar to carry, dividend yield and yield spread in other asset classes. If you have one factor to focus on, this is it. Commodity investing does not have to be difficult. It does not have to be special relative to other classes. This does not mean there is easy money to be made in commodities using just the basis, but you can figure out if you are facing headwinds or tailwinds. Out goes quantitative easing and in comes more forward guidance. This is the message we are being sent along with the signal of the Fed stating that it will raise rates higher than previously expected in 2015. This was bad news for the bond markets which discount future spot rates. But what is the Fed really telling us? One view is that the economy is doing better than expected and Fed liquidity is not needed. The Fed would only change forward guidance if the economy was doing better. This, however, is not what has been seen in the data during the fourth quarter. The latest announcements was also more confusing because the previous "forward guidance" was that easing would come to an end once we hit 6.5% unemployment. We are now at 6.7% unemployment but these unemployment numbers do not seem to represent the true slack in the economy. So now that the Fed has gotten close to its previously stated goal it has moved the goalpost or changed the game by saying that they will look at a broader mix of data to tell whether there should be a change in policy. No rules. We now do not know what numbers to focus on other than we need to look at all of them. Can you really call this forward guidance when the central banks says something like, "we are going to look at a lot of things." CALPERS asset allocation - does it go far enough? 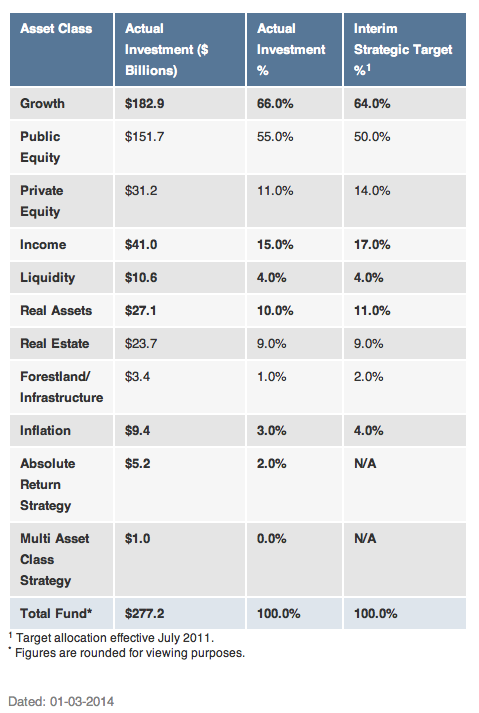 The CALPERS asset allocation represent a very a half hearted attempt at the "new school" approach to asset allocation. By new school, we mean an allocation strategy that tries to provide for maximum diversification. Some have called this the Yale endowment model; however, given the size of CALPERS, their strategy has to be more firmly grounded in holding a broadly diversified portfolio of beta expsoures relative to other pensions. Their commitment to strategy diversification, however, seems limited. With 66% in equities, their strategy is not much different than a classic 60/40 equity/bond portfolio mix. The biggest differences come from the fixed income side of the portfolio. Income and real estate represent 25% of the portfolio. The remainder is associated with inflation, cash, and absolute return categories. At only 2%, the absolute return strategies are a very small portion of the portfolio. Any excess return is not coming from hedge fund alpha generators but from the long-term betas across asset classes. Relative to what has been the buzz in finance, this is a very conservative portfolio. It may not go far enough to get a return that will reduce funding costs if equities underperform. Is life-cycle investing a losing strategy? John Bogle recommends "roughly your age in bonds"; for instance, if you are 45, 45% of your portfolio should be in high-quality bonds. Bogle also suggests that, during the retirement distribution phase, you include as a bond-like component of your wealth and asset allocation the value of any future pension and Social Security payment you expect to receive. I have recently been focused on some conversations about asset allocation. The question came up of what should be the correct allocation for a retired investor. From that initial discussion, our talk moved to the value of life-cycle funds. It has been a very successful innovation in money management but is it worth the price? There is a set terminal year and the allocation will change as time moves to this terminal date. The portfolio will become more conservative over time. Do you need to have someoen make those allocation adjustments based on your age? I don't think so. Still, the simplest case and easiest to follow may be the Bogle example. Set the allocation of bonds to your age. Nice and simple, except the rate on bonds is so low that you will not be receiving any income as you get older. The result is poor performance and faster dipping into principal. For just a modest lifestyle, the amount of principal needed is significant. Shouldn't alternative investments or income producing strategies be a better alternative? I am not advocating a single approach but more bonds in a low interest rate environment can be very costly. The same old logic in the current environment does not make sense. 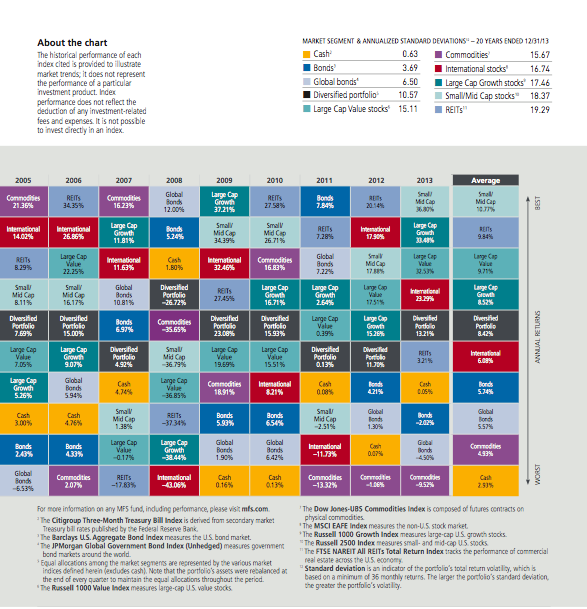 This single chart shows which asset classes have been up or down over the last twenty years. 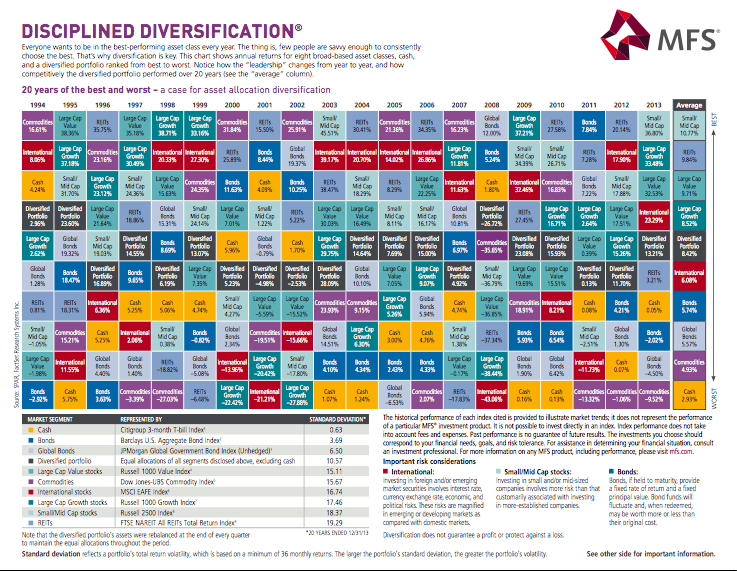 It clearly shows the value of diversification with the diverse portfolio having returns that are in the middle of the pack as would be expected through any combination of assets. You cannot go wrong with have a basket of asset classes. That is not the only point of looking at this. Rather the focus is what happens at the extremes and what is the dispersion of returns. Look at the last years. 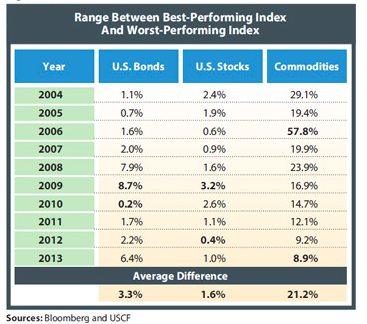 There was a difference of over 40% between the best and the worst asset class. There have been periods when the difference is only half that, but there have also been periods when the difference was over 50%. This will be more likely when we have market downturns. Commodities is one of the asset classes which moves from the top to the bottom most frequently. Mking the wrong decsision on asset allocation can be very costly. Making the right one will provide significant rewards. Determining how to make allocation tilts can lead to significant rewards when the cost of money management is signicantly less than the cost of making even a 10% allocation mistake. "We have suggested as a fundamental guiding rule that the investor should never have less than 25% or more than 75% of his funds in common stocks, with a consequence inverse range of 75% to 25% in bonds. There is an implication here that the standard division should be an equal one, or 50-50, between the two major investment mediums." You can argue with the min or the max but the Ben Graham comments focuses on an important aspect of asset allocation - setting boundaries. Moderation is one best lessons to learn for asset allocation. A rules-based system can ensure that this done effectively. The last ten years may not represent what we will see in the future. In fact, a close look at performance suggests that you are hard pressed to say what will be the most successful asset class over the next three years. Diversification rules. However, we can make some generalization such as bonds are not the best place to put your money if you are looking for long-term appreciation. Commodities in a low inflation low growth environment is a bad bet. Large cap allocations may be a long-term core for any portfolio. Nevertheless, the key take-away from looking at this table is to focus on diversification and portfolio structure and not trying to pick the next winner. Tilts in allocation could be made but you have to careful of any strategy that puts you all in any asset class. Daniel Kahneman, the Noble prize winner in economics, has an informative short interview in the Inc.com, Idea lab. He has some quick comments on a number decision traps or behavioral problems with decision-making that make for strong case for why systematic investing is an effective tool. 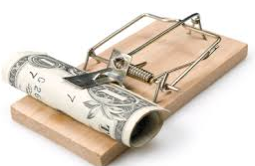 He discusses a number of decision traps that can be avoided through systematic trading. I provide some of the simple solutions which are all on the same theme. Use the numbers! Loss aversion - Your irrational fear of loss and how it messes with your decisions. Overconfidence - We place more stock on our abilities than the facts would suggest. "Always trust your numbers, never trust your gut". Solution: The numbers and history do not lie. It may not repeat but the truth is in the numbers. Use data. Outliers - One event can skew your outlook. Solution: The most recent numbers are usually embedded in our brains. Outliers are often vivid reminders which can be an issue. Avoid the "law of small numbers". Prediction - Personal stories have more impact. Solution:That is the problem our personal experiences cloud judgement especially if our experience is limited. Luck - We confuse luck with skill. "Don't mistake random events for causes". Solution: Most of the what we experience in the markets are random events. Systematic investing tries to look for relationships that are statistically significant. The all-weather portfolio that has been the basis for the success of Bridgewater is a good starting point for many discussions about global macro investing. The foundation of the all-weather approach is based on looking at the investment risks through a simple lens of inflation and growth. Inflation can be either expected to be rising or falling and economic growth should expected to be either rising or falling. Hence, a simple four square matrix can describe the world through these two simple risks. Each of he four quadrant in this simple approach can be filled with assets that will perform better in that environment. 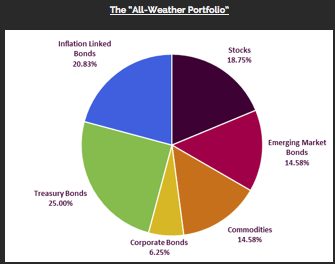 CSSA provides a nice diagram of what this Bridgewater all-weather portfolio will look like. It is a nice baseline for thinking about portfolio construction. The approach is based on the assumption that an investor does not have any idea of what will happen with growth or inflation. The investors is information-less. Hence, the best position would be to hold an equal weighting of asset in each one of the possible quadrant. It is all-weather because the investor has exposure to everything. 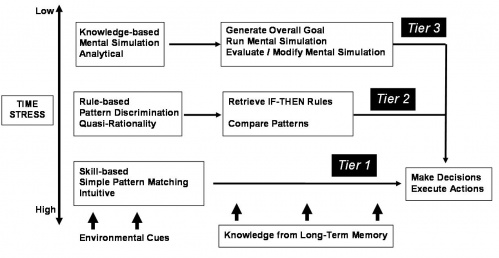 This is a good methodological framework, but it can be improved upon using some simple tools. First, the use of a risk parity framework can allow for allocations based on volatility and not cap allocation. Second, the definition of each category can be better refined. In simple terms, there is a huge different in a high growth scenario whether you invest in small or large cap, or whether you invest in the US or world markets. The same refinement applies to fixed income. Third, the whole process can be dynamic. That is, the risk weighting can change based on the environment faced. The baseline portfolio can be a foundation for discussion but also a jumping-off point for serious asset allocation action. Model versus man, who is better?